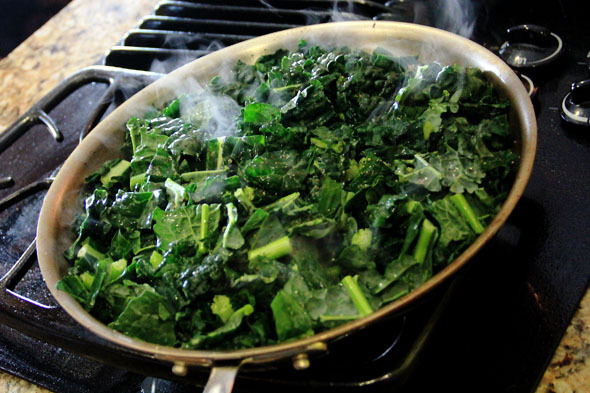 Kale is another one of those “super amazing superfoods” that helped me shed the pounds this year. You can really customize this quick and easy recipe to your personal needs. Here is one of my favorite ways to cook this bitter green down to deliciousness. I’m cheating by using pre-washed kale in a bag, purchased from Wegmans. It’s absolutely delicious. Although I’m not a fan of stems, and there are a few in here…it’s still a great dish. You can pick them out if you want — I usually do because I’m petty, I didn’t this time because I was lazy. Adding just a touch of honey at the end really mutes the bitterness associated with this vitamin-packed dark leafy green. 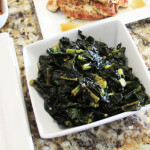 You can use this recipe for any “tough” green vegetable, it works great with swiss or rainbow chard. 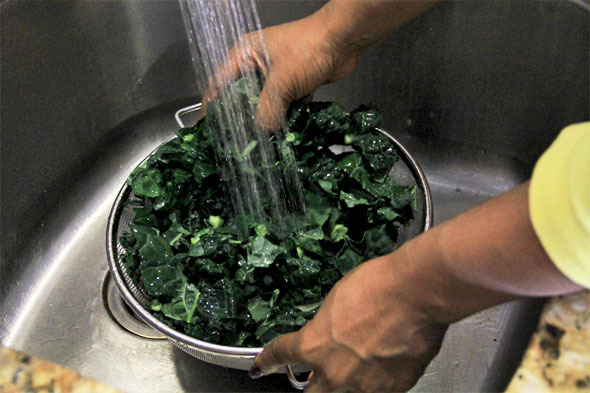 Wash kale with cold water and let drain. 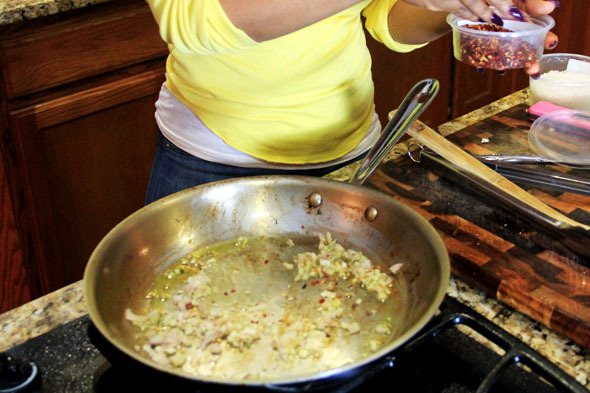 Pour olive oil and red pepper flakes in a large skillet, and bring to heat over medium-heat, until oil begins to shimmer and have a webby appearance and red pepper flakes begin to sizzle. Add shallots and cook for 2 minutes, until translucent. Add the kale, carefully in an even layer. Cover with lid and let cook without stirring for 1 minute. 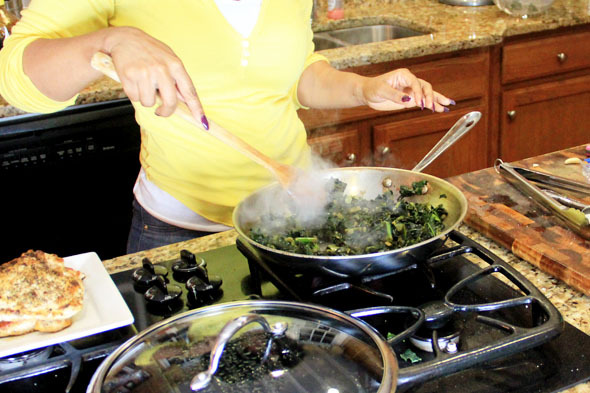 Remove lid and stir kale and shallots around until evenly mixed. Cover again for 2 minutes. Add garlic, chicken broth, vinegar, garlic, salt, and pepper, stirring to combine. Cover and let cook until most of the liquid has evaporated, about 8-12 minutes. 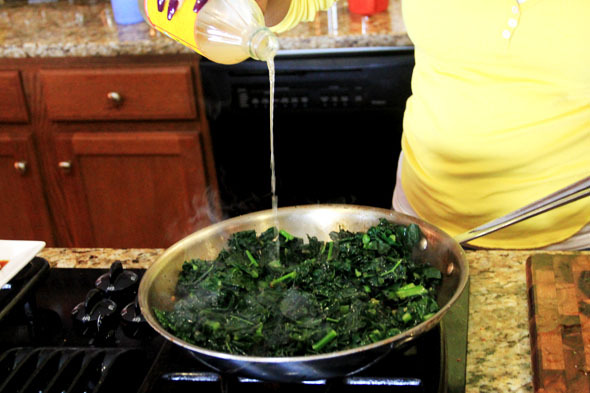 Depending on how tender you enjoy your kale, you could continue to cook it down even longer or enjoy it with al dente. Taste as you go, adjusting the seasoning as needed, adding more broth as needed. Add the honey at the very end to offset any bitterness. I’m really trying to cook more kale and this recipe sounds delicious. I cook spinach in a similar manner. When do you add the cider vinegar? you can honestly add it at ANY point but I just fixed the recipe because I didn’t realize I left it out of the instructions (doh!). 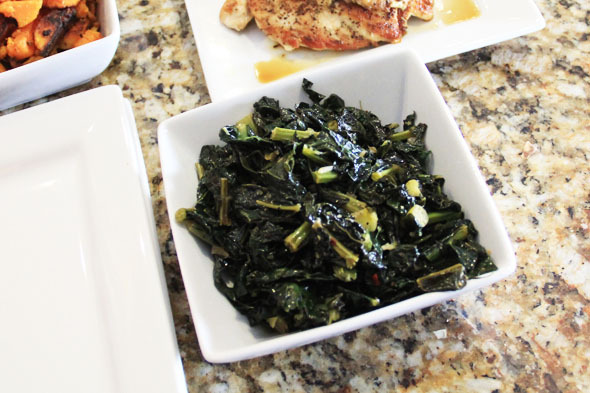 In my old age (35) I’m finding I love all kinds of Greens… I’m looking forward to making these at home. if you’re old, then so am I lol. just turned 34 a little over a week ago. Putting these on today’s menu…!!! 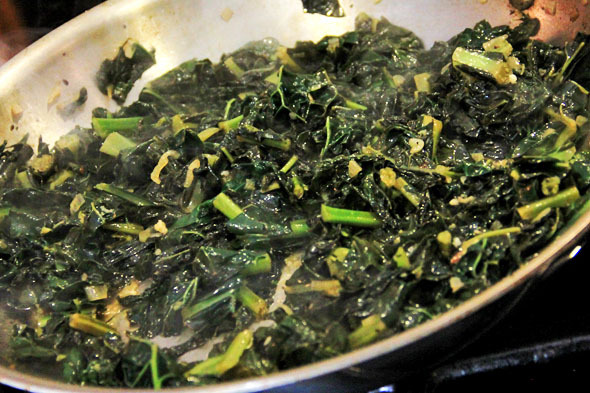 My attempts at sauteeing kale usually end up scorched and dry or too juicy…and growing up in the south… I am sure I am supposed to be a bigger fan of “pot liquor” but I am not. :-/ … I just can’t take all of the juice swimming on my plate. I made the pecan waffles for my husband & siblings and everyone loved them!. Thank you! 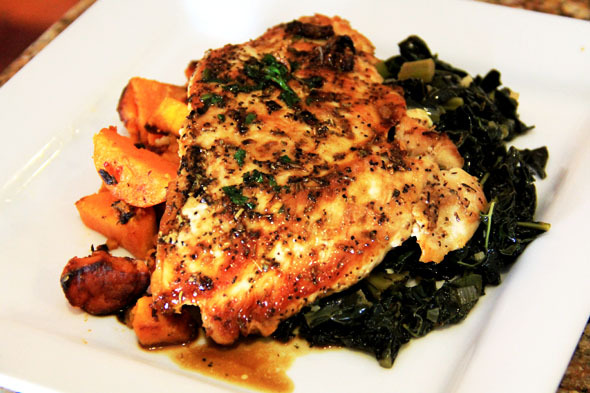 I was looking @ the pan seared chicken & sautéed kale and it looks delicious. We are trying to eat “clean” for @ least 4 days/week, but a lot of “healthy food” recipes are not tasty. 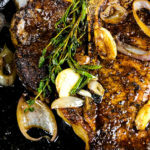 Are you going to post any more “clean” recipes on your site any time soon? This is the best kale ever! Thank you for your recipe. Ok, I guess I am not that bright, but I do not know what “Tuscan Kale” is or where to purchase it. Does Wegmans sell this in the frozen vegetable section? Wegmans has it for sure, but its in the produce section. It’s also called “dinosaur kale”, it’s flatter than the curly kind. Ask someone there and they can help you, I buy it from Wegmans all the time. It’s also sold in a bag near the bagged salad/spinach section. i don’t wanna eat clean when i make these for my ” friendsgiving ” on friday , do you have any added steps to make these into more of a holiday dish 😋 .